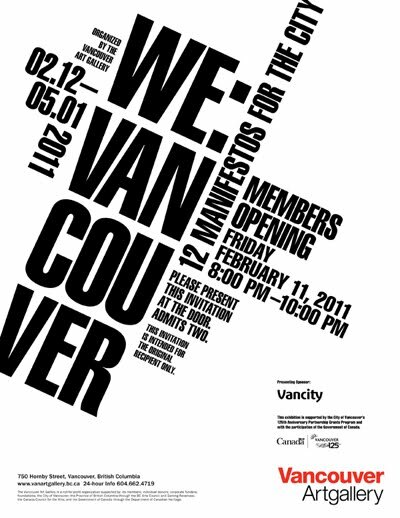 Here are some images of all of the Makeshift year clothes on display at the Vancouver Art Gallery (as well as 365 documented days of the project) during the WE: Vancouver - 12 Manifestos for the City. This show ended on May 1, 2011. Thank you to all who attended. You may have thought I was lost and gone forever but ... I'm still alive!! Even though I'm mostly in store bought clothes now! Yes, the truth is, my wardrobe is very very small right now (and mostly made by others) but the reason for that is because all of the clothes that I made/wore during the makeshift year are now on display at the Vancouver Art Gallery as part of a show called WE: Vancouver - 12 Manifestos for the City. The show is up until May 1st so it was a bit of a scramble to try to piece together enough stuff to wear until then. If you live in Vancouver and are planning to see this show, please come for a "performance" that I will be doing on the weekend of March 26th called Thing to Thing. During that weekend I will have a mini studio set up in the Gallery where you can bring any object to me and I will turn it into a bag! I'm not sure how the logistics of this will work yet, or if the numbers will be limited etc but there will be more info about this on the Vancouver Art Gallery website soon. It's been a very full month, if a little anticlimactic. I'm still wearing mostly my own handmade clothes but have been reveling in the cornucopia of shoes I now have to choose from. Also, I'm probably more excited about designing than I have been all year but mostly because I know that I don't have to wear my designs later that day. I thought I'd post a few things here today. My friend Zoe introduced me to subtraction cutting by Julian Roberts, which is kind of a random and improvised form of pattern cutting. I didn't have anything to wear to my award ceremony on Monday (British Columbia Creative Achievement award - Yay!) so I used the technique to make this dress. It was pretty fun to try out but I have to say it is not the most comfortable dress ever invented. Also, because I didn't line it, it's almost impossible to wear it the same way twice. The way I'm wearing it in this picture looks wholly different from how it looked on Monday. I also made these black "tulip" pants that are slightly less "tulip-y" than the grey pair I was wearing during the project. I'm still trying to decide which style works best. This draped top looks a bit like I used the above (subtraction cutting) technique but it's actually just tucked and stitched with sort of random darts. Well, that's it for now but I'm in making mode so I'll try to post a few more things in the next week or so. It's been a bit of a roller coaster ride for the past week since I've finished the project. It has taken some adjusting, some work to 'get me sea-legs' back. The first day was a bit of a disaster. I was so uncomfortable all day! Everything felt too small and my brand new bra had a prickly little something or other in the strap that I kept trying to find but it was not actually visible to the human eye. And I felt like an impostor in those clothes. Looking at the picture now, I think, who is that? And what a bad outfit she's wearing! I guess I have figured out a few things since then but honestly, I'm having a hard time trying to come up with some semblance of style. As a result, for most of this past week I've worn my same old makeshift stuff. Yupp, with the exception of shoes, it's been pretty much back to the old wardrobe that I've become so well acquainted with. A friend of mine asked me what permanent changes I thought have occurred as a result of completing the project. And now after a week of being back, I think that wearing things that fit well and are comfortable will be permanently very high on my list of priorities. I thought I had always rated it high on that list but now, back in my old faves, I'm realizing that I was deluding myself. I'm starting to feel a bit more like myself and am finally rediscovering my "style". It seems to be a precarious combination of a few key things that I made for myself this past year, some choice accessories and special pieces that I saved from my life before makeshift (It seems I didn't really keep very much stuff) and whatever "ready made" shoes will work with my look (the fun part, since I actually do have a lot of shoes). Also, I think I am going to buy some running shoes today. The time has come at last! On Friday, the show Kizuna opened at the Japanese Canadian Nataional Museum. It is a show of four artists, commemorating the museum's 10 year anniversary. My piece is a path made of rocks that I have wrapped and sewn old clothes onto. I will be giving a talk there this Thursday (the 16th) at 7pm. Also, I had fun DJ-ing at So Warm, the SWARM afterparty at VIVO on Thursday night. Thanks for coming out if you were there. If you missed SWARM, check out the show that just opened at the Contemporary Art Gallery. It's a gooder. Day 1 - of my new/old life! I got a lot of requests to see what I would wear on my first day 'back to normal' so here is my outfit. I thought I should wear at least one thing that I'd made, to kind of ease into things, so I'm wearing a black 'makeshift' t-shirt with my favourite Filipa K cardigan. I can finally wear the silver sand dollar earrings that my sister gave me for my birthday in June and also the jeans (Earnest Sewn) that have been my favourites for a long time. I am also wearing a thrift store belt that I've had for eons and a pair of underwear and bra that I bought the week before I started the project because I had some store credit that I wanted to use up and I new it would make me really happy on this day. I forgot to bring a box of stored shoes home from my studio yesterday but luckily I had these shoes (that my friend Kim had recently given me) at home. I wanted to go for extreme comfort in the shoe department but the more I went through my mental inventory of shoes I own the more I realized that maybe I don't even own a really comfortable pair of shoes anyway! Which leads me to some other points. First of all, I certainly don't feel more comfortable today than I have been all year (as I had anticipated). My cardigan is smaller than I had remembered it and my jeans don't stretch at all - I could barely bend over to do up my shoe straps! Also, it's been a long time since I've worn earrings (even though I made some earrings during the makeshift year) and I'm sure I'll get used to it but it was not fun trying to get them on. Plus I was looking forward to not having to 'get used to' things anymore! I feel like I spent the entire year 'getting used to' things - seams in socks, armholes that were too high, underwires digging in etc. At this moment, the most comfortable thing that I have on is the t-shirt that I made. Funny, no? Anyway, I guess my point is that we are always adapting and today, as I am adapting to my new/old life, I am begining to realize that I may have romanticized what this day (and "normal" clothes) would be like. Comfortable or not, I am pretty glad that I won't have make everything now. And I think that it will be fun to try to cobble together some sort of style that isn't All Me, All the Time. Maybe I'll report back on that in a week or so. Ok, over and out. Day 365 - My Last Day! Well folks, it has been swell. I thank you very much for following , commenting, engaging. I will still be occasionally posting with new thoughts and handmade things but I will probably be wearing a few things that I didn't make myself from now on. I am pooped. Please feel free to email me at makeshift@huntandgather.ca or continue to leave comments on the blog. I will possibly be making some of the more popular items available on my website (huntandgather.ca) so please check in once in a while or email me if you have any specific interests. See you out in the world. MakeShift is an art and research project that examines the relationships between 'making', 'clothing' and 'living'. The basic premise for the project is that for a period of one year starting on September 1st, 2009, I will only wear things that I have made myself. Initially this may seem like a reasonable task, but it will include all of my clothes, socks, shoes, underwear, coats, jackets, hats, bathing suits, accessories and anything else I might need to protect my body from the elements while trying to lead a fulfilling life. Beyond being a nail-hammering, speed-sewing, room-pacing, hair-raising, life-enriching personal challenge, I hope to gain some understanding of the limitations of clothing and how they affect the development of ideology. Ultimately, I would like to examine the role of clothing as a form of cultural production. I hope you will participate by leaving comments on this blog or stopping by the space for a visit. Makeshift is meant to be an exploration of ideas so the conversation that develops will become an important part of how the project unfolds.